The BETR (Big Eraser Triple R) Journey is about healing, developing a deep, deep level of trust, relationship, knowledge, awareness and skills for both horses and their humans. On The BETR Journey, step, by clear, concise, and simple step, we learn and grow together. In this article I would like to speak specifically about the extremely deep level of trust that the horse develops in her human on The BETR Journey and the resulting deep connection between the horse and her human. 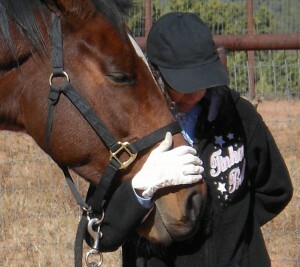 Trust is the bottom line in all of our interactions with our horses. It is the key ingredient to having beautiful experiences with our horses. The depth of connection that you have with your horse is directly dependent upon the depth of trust that you have in each other. And yet, I have found that not nearly enough emphasis is placed on deep trust regarding our relationships and interactions with our horses. 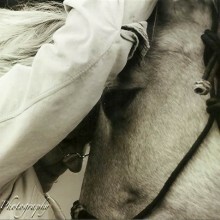 Even when trust is mentioned, it is not the kind of deep, deep trust that unlocks the door to the horse’s very soul. When trust is talked about, it is referred to as something that needs to be earned. I agree with this. However, that is only part of the story. Trust must also be nurtured and developed. How to do this is rarely taught. I hear a lot about the dominant approach to the horse, and I hear a lot about the partnership approach to the horse, but I hear very little about building a relationship that is based on developing deep, deep trust. On The BETR Journey, developing the horse’s trust begins with The BIG Eraser. All horses experience a certain amount of traumas, both big and small, during their lives. During an “erasing” session, the horse cycles through the three phases of healing — Recognition, Processing, and Release. During the processing phase, the horse focuses on the residual deep muscle tension that has developed as a result of past traumas in order to release both the tension and the trauma. The processing phase resembles a self hypnotic state, and while she is in this state the horse has little to no awareness of her surroundings. Here is a quote from Patty M. of Colorado, USA regarding something that occurred during an erasing session with one of her horses. “A beautiful red fox came walking within 10 feet of us, stopped and looked at us, and Jagr never saw it.” This is an extremely vulnerable situation for the horse, as a pray animal, to be in. It is a threat to her very survival. Each time the horse comes out of processing and sees that she is safe and that her human is still there watching over and protecting her, the horse’s trust in her human grows. Developing deep trust continues throughout The BETR Journey with consistency in all of our actions and interactions with our horses. What are the things we always seek to be consistent about? We always seek to interact with the horse from deep within an open heart. When we open our hearts, what flows out is understanding, compassion, empathy and love. We always seek to offer the horse relaxation, comfort and protection. We always seek to stay in the moment and maintain our deep focus on all of the subtle communication the horse is continually conveying to us. We always seek to listen to what the horse is saying and allow this to guide us. We always seek to interact with the horse in a clear and concise manner that eliminates confusion on the part of the horse. We always seek to never do anything to cause the horse discomfort. While we may ask the horse from time to time to step out of her comfort zone just a bit in order to learn something new, we never use pressure or force. The deeper the trust that the horse has in you, the more she will be able to attain and maintain relaxation in her mind and, therefore, her body. The more relaxed her mind is, the more she will be able to stay focused on you, the faster she will be able to learn, and the quicker she will respond to your requests. Deep, deep trust is the key that unlocks the door to the horse’s soul and allows her to completely surrender herself to you.